I wake at 4.00am, but manage to drop off again until 6.30am. Tam has been awake much of the night and has a theory. She thinks there are 2 reasons for her sleeplessness  jet lag and altitude. Now, Ive never heard that being at altitude can prevent you sleeping, but we can test her theory tonight when we return to sea level in San Francisco. We have coffee and Danishisisis at the food court in Yosemite Lodge before wishing a fond farewell to the falls and departing at 8.10am. The drive out of the valley is as beautiful as ever. Id advise anyone thinking of visiting California to make sure they spend a few days here. It definitely pays to stay on the valley floor; virtually anywhere else is an hours drive away. Somewhere between Mariposa and Merced 2 cars pass us and the lorry in front of us. I speed up and follow as well. Just as I do this I see a police car on the other side of the road. A furtive glance in the rear view mirror sees the police vehicle doing a U-turn and coming down the road after us. He cruises up behind us and I fear the worst. Luckily he overtakes and chases after the cars ahead with lights flashing. They all pull over and I pass on by with a smug and relieved look on my face. I had visions in my mind of being asked to step out of the car and place my hands on the hood. I would probably have got away with it though; I would have blamed it on having 3 women nagging away at me simultaneously. Any man in the world would be sympathetic. On the down side, if it were a female cop, I would probably be facing 3 5 years in the state penitentiary. Just outside Livermore we pass the largest wind farm in the world. It goes on for miles. Mind you, one member of our party has had no problem farming wind on this holiday. The name will be withheld to protect her modesty. We reach San Francisco after 4 hours and cross the Bay Bridge. We have directions to our hotel and these work perfectly. 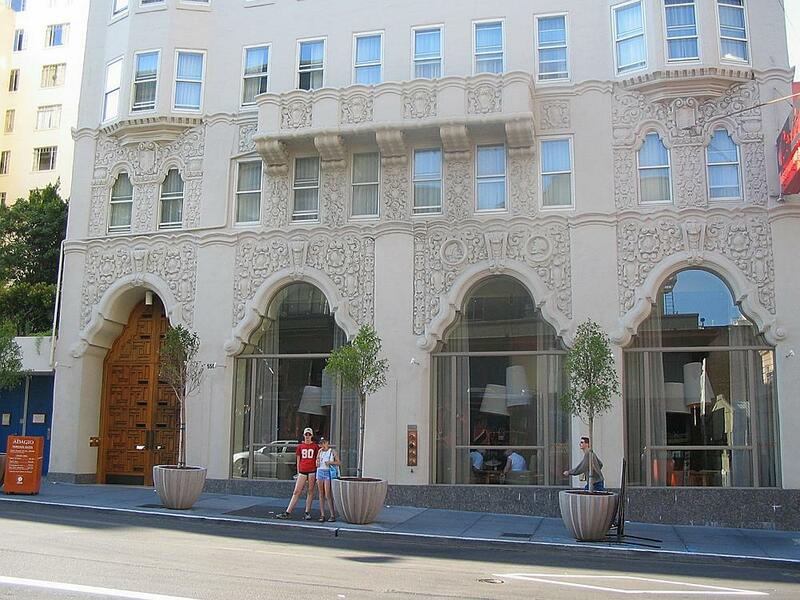 We are staying at the Adagio on Geary Street. Its quite a chic, modern interior and the car is valet parked for us. 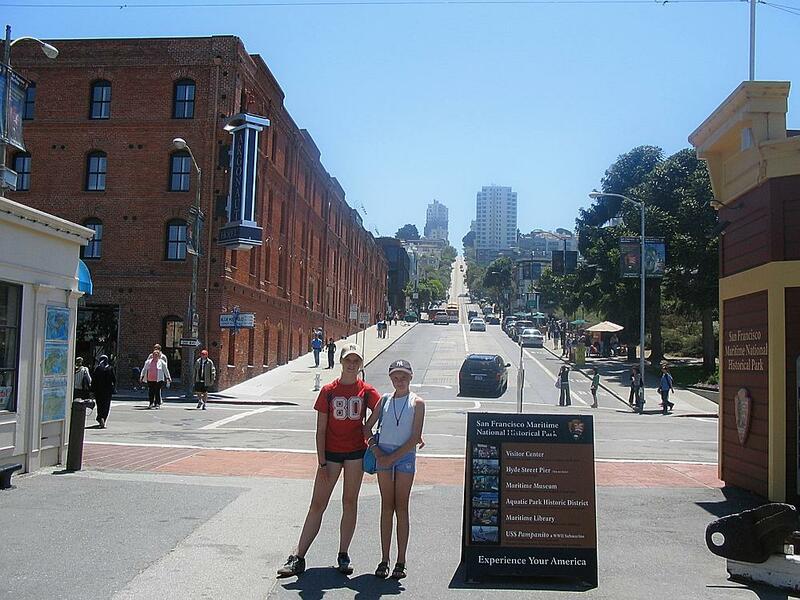 The room is not yet ready so we drop off the luggage and go out to get the cable car to Fishermans Wharf. 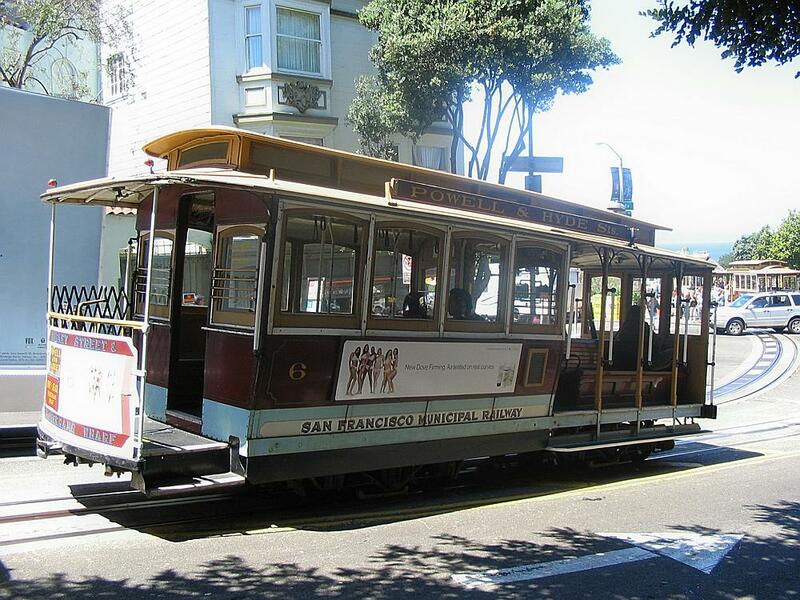 I know this might be a very touristy thing to do, but how could you go to San Francisco and not ride the cable car? 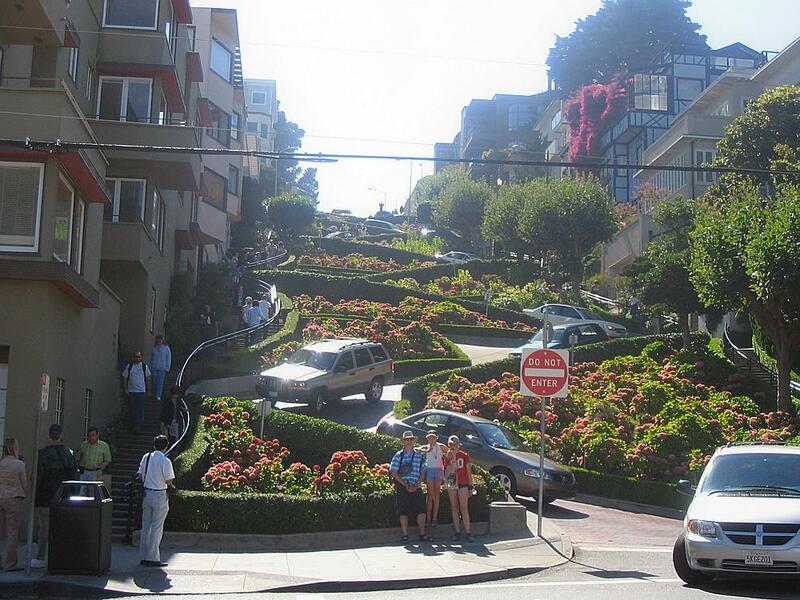 Its $3 per person one way and is our first introduction to the hills of San Francisco. At the wharf we have a brief look around before dropping into the Cannery. This is a renovated warehouse complex with shops, bars and restaurants. 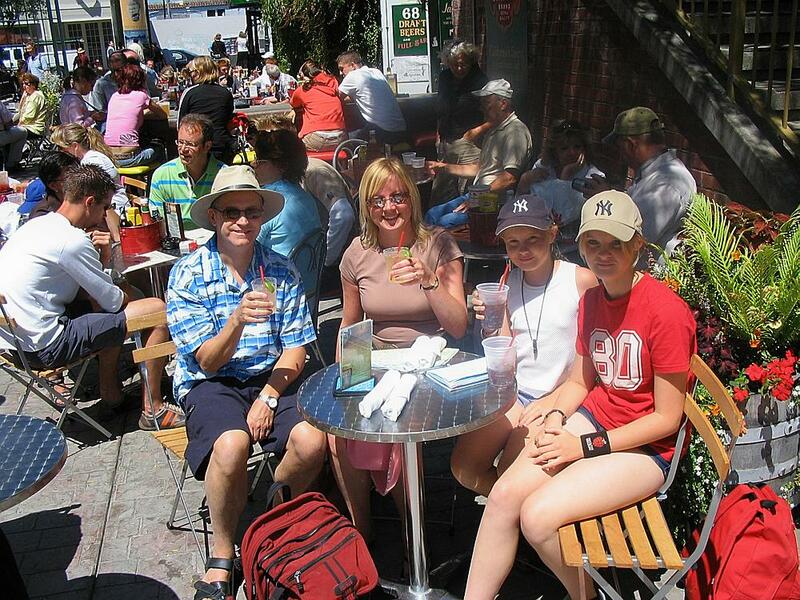 It is a pleasant place and we sit outside at a place called Jacks Bar. Here we have Chicken Caesar Salad, clam chowder in a bread bowl and fries. The main reason for choosing this fine establishment is the notice proclaiming Margaritas for $4. Yes please landlord! Another beer follows and with Cokes for the girls it comes to $52 without tip. Its lovely sat in the sunshine as its in the low 70s here; there is even a breeze off the ocean that feels quite cool at times. A girl called Essence is singing and playing guitar in front of the bar and she is so good we end up buying her CD. There is an American couple from Seattle sat at the table next to us and we get chatting. They are great company and the man tells us he retired 10 years ago and they now spend much of their time travelling the world. Now, thats the way to do it. Leaving Jacks Bar we walk along Fishermans Wharf. Some of it is a little tacky, but its a great place if you like shrimp or crab, there are restaurants and stalls galore. 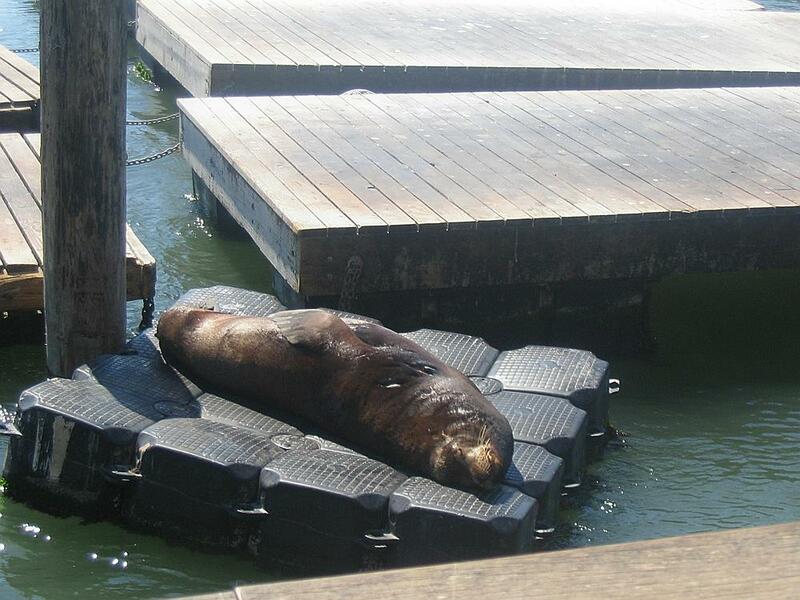 At Pier 39 we watch the sea lions basking on the floating pontoons. The girls would watch them for hours if we let them. It's hard being a seal. There are loads of tour boats offering trips under the Golden Gate Bridge and around Alcatraz. We might do this tomorrow. At the end of the pier the girls spot a huge candy store called Candy Baron. A few dollars are spent here although most of the sweets are presents for their friends. We walk back inland for a few blocks to the base of Lombard Street, which is the famous winding street you see in all the films. It is a never-ending procession of cars driving down. I bet the residents love it. We walk up the side of Lombard Street to catch a cable car back uptown. After a couple go by and dont even stop because they are already full that I get the feeling that we will need to walk back to the cable car terminus to have a chance of getting on. When we get there, the queue is huge. Never mind there is the start of another cable car line a few blocks away, well try that. We tramp up to it and the queue is huge there too. Now there is probably a much easier way of getting around, but we dont know what it is and there are no taxis to be found. Theres really only one thing for it. Stringer party, best foot forward, quick march. Having yomped all over Yosemite the day before last, little feet are very tired. India and Georgia say theirs hurt too. 20 blocks up and down the steep hills of San Francisco is probably not the best idea. Still, we make the best of it and enjoy it as much as we can. Some of the houses are very pretty indeed. We eventually arrive back at the Adagio and check in. Our room is on the 15th (of 16) floor, 1508. Its a big room, nicely decorated in a modern style. We booked our 2 nights using Airmiles, so its a freebie. One thing that is a little unsettling is the number of beggars about. As Tam says, in New York we didnt see a single one due to the zero tolerance policy. Im not sure that putting people in jail or moving them on solves the problem. I know that you arent supposed to encourage them, but dropping a few cents in their cups doesnt hurt me and might just help them a little. We leave the room around 8.00pm and walk through Union Square (too many shops here for my liking!) into Chinatown. The shops are full of much of the same things that I saw in Hangzhou last time I was in China, but a bit more expensive. As we walk we look up and are amazed at the speed that the fog is rolling around the tops of the buildings. I thought things like that only existed in horror films. We pick a restaurant to eat at completely at random. Its called the Empress of China and you have to take the lift to the 6th floor. Here you get great views out over that part of the city. Oh joy of joys, they have Tsing Tao, my favourite Chinese beer. Between us we share lychee chicken, sweet and sour pork, Manchurian rice, beef in black bean sauce and vegetable chow mein. The food is very nice indeed, Im no expert on Chinese food, but I couldnt fault this. Even the bill is reasonable at $69 without tip. At the end of the meal we get fortune cookies. Mine says You have a good sense of humour and love a good time. Thats one in the eye for all those that think Im repetitive and boring. I said thats one in the eye for those that think Im repetitive and boring. Georgias says You will attract cultured and artistic people to your home. Bodes well for the future I suppose. At least Im not repetitive and boring. We walk back to the hotel, but not before Tam and India have decided they are coming back tomorrow for some shopping. I can barely contain my enthusiasm. Back past the beggars we go. We dont feel threatened at all as they are all fairly polite, but it is a sad sight. Back at the Adagio we book up to eat at the Cortez restaurant. The Cortez is part of the hotel and is a very funky, cool looking place. After all the walking bed is a welcome sight at 11.15pm.